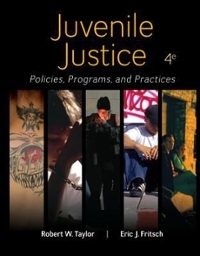 Juvenile Justice: Policies, Programs, and Practices 4 Edition Juvenile Justice: Policies, Programs and Practices provides a student-friendly introduction to the juvenile justice system. Practical application is emphasized through features that focus on policies, programs, practices and careers. The text reviews the current legal atmosphere of juvenile justice and current events that have impacted the field.